It’s here… it’s gone… it’s here… and it’s gone, the ever elusive Minnesota Spring has broken our hearts more often than not. This year, it was May 7th when we (as Native Minnesotans) were finally able to enjoy a normal spring day. And even though our newfound excitement for the changing of the seasons focuses on the exterior of our homes, many of us attempt to bring as much of Nature’s rebirth inside as possible. So to help with our new season (and shifting style preferences), here are the 2018 Color(s) of the year as well as some new Home Trends for spring. A bold statement to say the least, Caliente AF-290 from Benjamin Moore is the perfect shade to give a splash of rich color to your home. It warms even the coldest of spaces with its burning hues that are anything but cool to the touch. It works well with both chilly neutral grays as well as earth toned wood flooring and beams. Use it sparingly or as an accent wall that demands your guests’ undivided attention. A soothing summer retreat, where the only thing more refreshing than the cool blue of the water is the drink in your hand. Oceanside from Sherwin Williams welcomes you to kickoff your shoes and step off the dock. Use its tranquil hue to make a calming space, like a bed or bathroom, seem like a temple of peace. Or introduce it into a workspace like a home office or den, to combat the stresses of the mental grind. Crowned as being the color of the future and the mysteries that await us, Pantone’s Ultra Violet is a reminder of the evening summer skies that exist only beyond the reach of the city’s nightlife. It seems to land on the bolder side of the color wheel but yet possesses a relaxing tone that makes you want to study it for hours on end. There was a time when using Gold and Silver in the same space was considered a mortal sin among the interior design community. But oh how quickly things change. As apparent in the photo above, gold and silver not only coexist in the same room but thrive. Each compliments the other by providing the same texture without overpowering the home with too much of either hue. Want to ease into this trend? Try introducing small doses into your kitchen before utilizing these materials in other rooms. For years, homes have relied heavily on a series of Neutral colors (Brown, Black, Beige, White, and Grey) to occupy and tie other accent colors together within a room. And if you have spent any time in a home furnishing store you’re familiar with the ‘Rise of Greys’ in upholstery, flooring, wall coverings, and wood stains. But for some, these neutrals don’t possess enough warmth or impact, and with spring in full bloom, it’s the perfect time to experiment with a bolder neutral. Geometric designs and shaped are a great way to throw a little more life into the décor of your home. But this year, more and more geometric designs are transitioning off accent pillows and throw rugs to become featured designs on focal walls and flooring or decorative tiles. 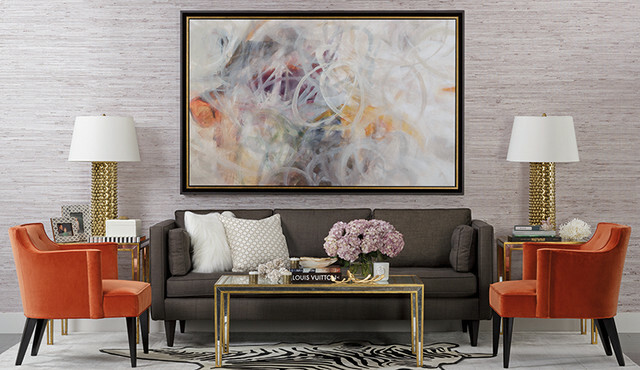 This new explosion of dramatic lines and angles isn’t for everyone, so if you are curious enough to give it a try, start with smaller replaceable pieces such as area rugs and wall art before investing your time and money into a larger project like tiled flooring or stenciled walls. This one is all about finding a balance between elegance and rustic. Introducing Natural elements like wood and stone creates an extension of the outdoors without the added chore of plant care. In the photo above, you can see how the stone work of the fireplace and the deep stain of the wood flooring warms the space while balancing with the formal stylings of the furniture. This also gives the space a hint of traditional flair to an otherwise modern look. So if this is the year you decide to take spring cleaning to the next level, keep these trends in mind. Who knows, your home might thank you for it. Why you should buy Flooring from Dirks instead of a big box. It’s that time of the year once again. The sun is hanging around more and more everyday. The kids are ready to burst through at the seems thinking about the end of the school year, and everyone is ready to spend the weekend at the Lake. But for some of you, this year is different. Your first born (or another one of your cubs) has grown up so fast and is ready to graduate high school. Which means it’s time to get the house in shape to entertain friends and family. One of the biggest projects most will undertake is a new floor. But with endless options of vendors and materials, how do you decide which ones are right for you. To me, the answer is easy, look for experience and attention to detail. Now if you are reading this blog, you clearly know where this conversation is going. I won’t tell you this isn’t a sales pitch, because it is, and I won’t be embarrassed by that fact. In truth, Dirks Furniture would love to have your flooring business, but what’s more important to us is that you make the correct decisions for your home. That being said we would like to share with you why our flooring department should be a part of the conversation when you’re ready to start your remodel project. Just for the record, nothing any of the big boxes sell is “free,” whether it be carpet, pad or labor. No one stays in business for long when giving products away, and as far as offers for free installation go, would you work for nothing, not collecting a paycheck? Absolutely not! And neither would the installers who are contracted by the big box stores. All of these costs of “free” products and services are hidden somewhere in the price that the big box stores quote you. Now, you may get a break on carpet or labor, but only if you agree to purchase a specific carpet pad at an inflated price. Reputable independent merchants won’t (and can’t afford to) play this game. They must stake their reputation and their future on developing loyal customers and serving them the best they possibly can. For example, at Dirks, once one of our sales associates has measured your room(s), we will provide you with a complimentary estimate, by line item, containing all costs pertinent to your project. Any additional, necessary charges to the final invoice will be agreed upon by the installer and the customer. Still not convinced, that’s okay. It’s not my job to convince you to shop with Dirks Flooring Center, well, actually it is, but it is also my job to educate you about the truths of the floor covering business. Can you say the same about the big box guys? Shorter Days and chilling winds are heading our way. That’s right, Fall is waiting in the weeds and before we realize it August, once again, will be leaving us in its wake. But as the season changes, so does our tastes. Wines and beers become heavier, baseball gives way to football season, and pumpkin spice is everywhere. With all of these things comes a sense of being comfortable and cozy on those chilly evenings. To help warm your home this fall, here are a few of the upcoming design trends that will prepare you for those brisk days and long nights. Pink tones have been making a comeback as of late, so it’s no surprise the expected feature color this fall season is ‘Blush’. Subtle yet elegant this pink tone gives a light contrast to the typically dark earth tones (ALL of which will be in high demand once again this year) while maintaining the warmth we expect from a featured Fall color. If you are a die hard earth tones junky, don’t worry, neutrals like browns, beiges, tans, and warmer grays won’t be going anywhere anytime soon. All will be the base of every home’s fall décor. Rustic tones such as deep greens, oranges, yellows, and reds will also be present, but use these sparingly as not to overpower the space. And as always be careful if you will be featuring ‘Blush’ among these bolder tones. Another way to transition your home from its Summer vacation is to add textures where they are lacking. This can be done with dramatic weaves in area rugs, throw pillows and blankets, as well as wall art. You can also apply faux furs to your sofa to give the room a layering effect of warmth. Think of it as a wool sweater under a tweed jacket for your living room. Swap your light throw pillows for heavier earth tones and all you’re missing for a cozy night in is a good book and a glass of vino. This is a beautiful example of a transitional living room. The fall elements are represented perfectly with the orange armchairs, brass accents on the lamps and coffee table and the faux fur area rug. There’s even a splash of blush in both the wall art and the floral arrangements. All of these elements are added to the neutral charcoal sofa, walls, and floors making it easier to transition the same layout from season to season. How Much Wood Would a Woodchuck… You know where this is going. Wood, its everywhere except your… nope, its there too. Wood has been a design stable for years. From flooring to case pieces and everything in between, it seems to be one element that never stops expanding… pardon the pun. This fall season is no exception to the wooden rule. Rustic woods are still the preferred species, but traditional hardwoods will also pass the muster. This space shows a perfect example of how to balance both rustic and traditional hardwoods with other design elements. The end result is rustic yet elegant, two things that are perfect for the Fall season. 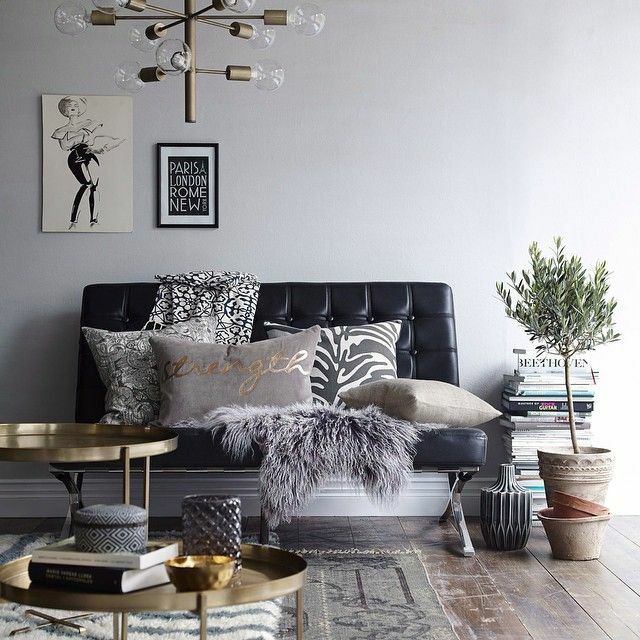 When it comes to incorporating it into your living space, brass will always be a love it/hate it scenario. Its a bolder trend and therefore a much more difficult one to manage. But how does the saying go? Fortune favors the bold? If you are one that is biting at the chance to infuse this stern metal element into your living quarters, it is better to go small. Sleek lines and smaller touches of the vibrant material will transition and work much better with other Fall elements than it would in large increments. So if you want to show off your decorator’s eye, stick to multiple slender pieces that are placed throughout the room instead of larger pieces clustered together on the same end table. Now that you know the latest design trends for the upcoming season be sure to include the most important design element in your home décor, yourself. 2017 Color(s) of the Year? It is well known how important color is when it comes to designing a home. Many of us know the pain of picking out paint swatches just to be disappointed with the shade of blue that we thought would look perfect in the upstairs hallway. “The natural light really brings out the true brilliance of its tones.” “It dries lighter, just let it sit overnight.” We’ve heard it all. So why do we put ourselves through the exhausting chore of picking out the perfect color? Well, because we need perfection. And its not perfect until someone assures us that it is. At Dirks Furniture, we understand the importance of your home. And the perfect blend of colors that make up your home can be just as critical as the right sofa or table. But how do you expedite the process of selecting what hues to which you will trust your walls? Enter paint industry giants Benjamin Moore and Sherwin Williams. Allusive and Enigmatic, Shadow (2117-30) by Benjamin Moore is a true master of ambiance. Described by Sherwin-Williams as a timeless neutral that’s both modern as well as classic, Poised Taupe provides a beautiful balance of warm and cool. Earthen Brown combines with Conservative Grey resulting in a weathered, woodsy and complex neutral that celebrates the imperfections and authenticity of a well lived life. The Sherwin-Williams design team recommends pairing Poised Taupe (SW 6039) with Gale Force (SW 7605), Stardew (SW 9138), Mountain Air (SW 0014), or High Reflective White (SW 7757) for a complete cooling look. For a more vintage vibe, the company recommends you matching Poised Taupe with Roycroft Rose (SW 0034), Brandywine (SW 7710), Sheraton Sage (SW 0014), or Alchemy (SW 6395). “A refreshing and revitalizing shade, Greenery is symbolic of new beginnings. It is a fresh and zesty yellow-green shade that evokes the first days of spring when nature’s greens revive, restore and renew. Illustrative of flourishing foliage and the lushness of the great outdoors, the fortifying attribute of Greenery signals consumers to take a deep breath, oxygenate and reinvigorate. Since 1929 the La-Z-Boy Furniture Company has produced and patented the world’s most recognized recliner. Dirks Furniture is here to tell you why the La-Z-Boy brand has been synonymous with quality and comfort for over eighty years. La-Z-Boy has the best mechanism in the world and they know it. This is why they offer a limited lifetime warranty on all their reclining mechanisms and frames. Ever want to recline without kicking your feet up? How about rocking while you recline? La-Z-Boy recliners feature an independent reclining action that allows you to do both with your feet set firmly on the floor. This makes for a great advantage to finding that perfect level of comfort after a long day. Who says you can’t customize how a chair sits? The adjustable reclining tension of the La-Z-Boy recliner allows you to increase or decrease the tension of the chair’s backrest to customize the amount of effort it takes to recline the back of the chair. This is done by tightening or loosening two wingnut mechanisms located in the base of the chair. Tired of a sagging footrest? With the La-Z-Boy recliner’s locking footrest you can be assured that your legs will be supported at all times and your feet will not sag when comfort, and more importantly, safety matters most. Everyone hates a wobbling chair. La-Z-Boy recliners are crafted using a four sided unibody box frame. This mean that instead of an open front behind an extended footrest, La-Z-Boy has taken the extra step in constructing a fourth side to all its reclining bases to give their chairs a sturdy non-tip base. The four sided base also prevent the chairs frame from bowing over time. If you are someone that has trouble finding that perfect reclining position, you will love La-Z-Boy’s patented Seat Tilt Ratchet Mechanism. This allow you to adjust the seat and footrest to pitch into eighteen separate angles. Maximizing the comfort level for every lounging occasion. Amish furniture is arguably the best made and highest quality of any on the market today. Whether it’s dining, bedroom, entertainment or office, Simply Amish produces each piece worthy of heirloom status. It’s all about attention to detail. Each piece is built specially for each individual customer, not on a production line. Hand-sanded, hand-stained and polished by artisans who have been in the furniture business for generations. Not only are the tops and sides of these pieces finished, the undersides on them are finished, as well, to guard against cracking or warping. On top of that, every piece is signed by the individual who produced the piece. Simply Amish is so proud and confident in their work that they place a lifetime guarantee on all of their furniture. If your furniture fails during normal household use in the lifetime of the original owner due to problems with workmanship or materials, Simply Amish will repair or replace it for free. Your furniture is tracked by your name, so each craftsman knows precisely who they are building for. In the event that your furniture needs warranty work, it will be returned to its original maker and restored to the way it looked when it left his shop. That’s a warranty! When customizing your Simply Amish pieces you may choose from seven popular hardwoods: Red Oak, Quarter Sawn White Oak, Soft Maple, Hard Maple, Cherry, Hickory, or Walnut. With dozens of stains available, standard soft-close drawers and doors, you can truly make your furniture fit your taste. 104 years ago August Dirks picked up a pen and made a swift swipe, imprinting his name at the base of a single sheet of paper. There was confidence in that swipe. A proud dream of what life could be for a small town furniture store. In that same swipe a promise grew. It wasn’t one of mere reassurance or lip service, but a true vow a man makes to himself. This vow gave birth to the philosophy that has stood side by side with the Dirks name for generations, Quality Matters. It’s a strange concept right? Quality. It’s what we all strive for but many of us settle for less everyday. A quick burger from the drive through, a cup of instant coffee, we all seem to sacrifice quality in favor of time, and sometimes, money. Now, a mass produced burger or a small cup of instant brew every now and then won’t hurt you, but what happens when we let low quality invade our furniture? One trip to the local landfill could tell you wonders. In an industry that is forever changing, we at Dirks Furniture stand behind our cornerstone philosophy. This is why we only carry the best in quality furniture, flooring, window coverings and HDTV’s. From the moment you step through the door, you will notice what we mean by the Dirks Difference.